As I was trotting towards the tea bar to fetch Mrs Hatt a cup of coffee during the first half of the game at Brixham, it occurred to me that it was the first time we’d attended a game together since the infamous day back in May when we finished up on the pitch at Forest. When I first met Mrs H, I knew she was a football fan, she was a regular at Belper Town and did make the occasional trip to see Forest. It felt to me as if it were my duty to expand her horizons. 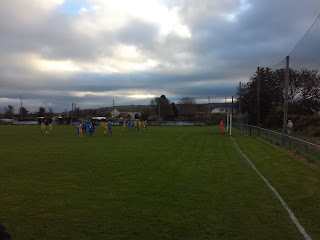 Mostly, it’s been successful, we’ve had some great days out at places like Conwy Borough, Barry Town United, Llangefni Town and Penrhyncoch (we like Wales), plus overseas trips to the likes of Derry City, Bangor, Waterford United and Cork City. However, it’s not always gone quite to plan. 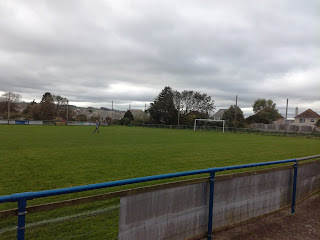 We were at Cobh Ramblers on a suitably cold evening where she never left the bar, but probably my crowning glory came in the very early days when I suggested an Anglesey League game. What I’d failed to mention at the pre-match stage of proceedings, is that it was probably at a significantly lower level than she’d been used to. In short, it was a field, and to access it we had to walk about a quarter of a mile from the dressing rooms, in a force whatever gale, through scrubland to a venue that offered fine views of the ferry terminal at Holyhead. The volume button was set to mute, she sat on an adjacent swing as the players warmed up (had a piss and a fag), and it was only going to be a matter of time before I was beckoned. I never saw the game kick off, we were back in the car and heading back to our base to watch the Play-Off Final on telly, my lesson had been learned. But, whenever we go to the South West, be it Devon or Cornwall, we do make every effort to get to matches together, because for me, there is no better part of the World to be watching football. We’ve been to Plymouth Argyle, Totnes & Dartington, Perranporth, Weymouth (ok, it’s Dorset), Stoke Gabriel and Newton Abbot Spurs, all of which were great trips out, not least because of the company. It’s all about managing expectations though. If it’s not an Executive Box at the Emirates, don’t try and paint a day out at a South West Peninsula League ground as like being in an Executive Box at the Emirates! That said, research is all important. Things like food, drink, shelter and seats make a difference, do your homework, explain your findings and the day should run smoothly, and it invariably does, except perhaps for a time when we were at Whitehawk and I miscalculated the walk from Brighton Marina! We like Brixham, and of all the games on offer today it ticked the boxes. I did think about Teignmouth but felt that given the harbour and the attractions the Torbay town has to offer, it was the better option. It also had a Wetherspoons, and let’s be honest, if you don’t like a Spoons then clearly you need some form of frontal lobotomy. The ground at Wall Park is close to the centre of the town, but it’s probably also at its highest point, so on a dry Autumnal day it was somewhat blustery, and the wind was helping carry the noise from nearby Brixham Rugby Club who were beating Hornets in the South West Premier League. A friendly welcome at the gate lead to a small car park, adjacent to which all of the facilities at Wall Park are contained. A clubhouse with adjoining dressing rooms have what is effectively a conservatory built in front of it, so you can watch the game in warmth and comfort, a bit like an Executive Box at the Emirates maybe? 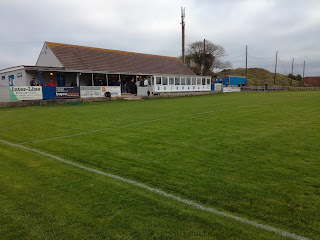 A row of bench seats extends from the far side of the clubhouse towards the corner flag, and it was on these benches that we took our seats to watch the game. The rest of the ground is just open standing, with a rail but no floodlights, and given the fact it’s located in a residential area, I’m not sure how easy it will be to get permission? I liked it, it was well cared for, it was neat and tidy, and the facilities were very good, as you would expect in a league that sets and demands such high standards. 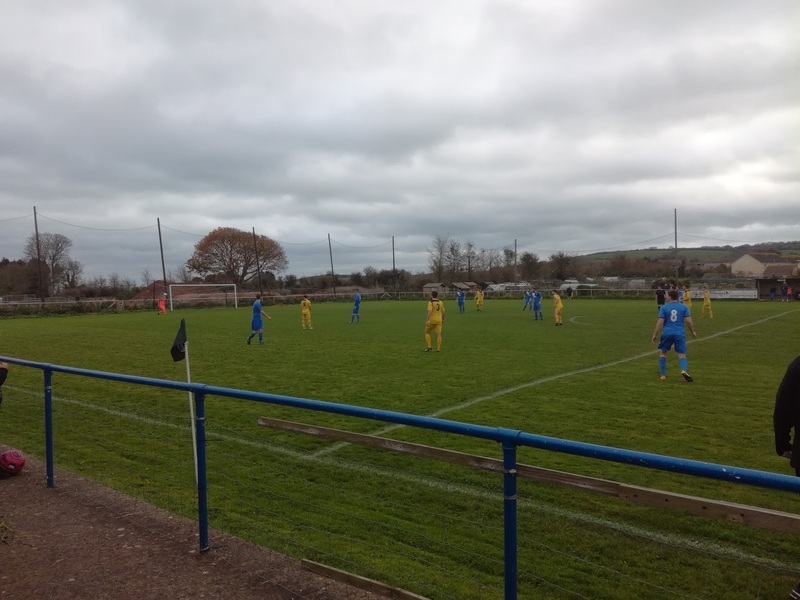 Visiting Newton Abbot Spurs sat second in the league before kick off, Brixham were below half way, but as often happens, the game didn’t reflect the standings. 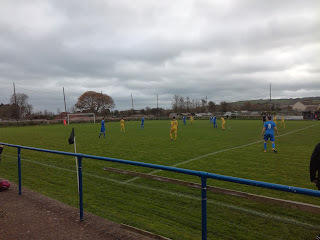 Brixham got a grip on the game early on and found themselves with a 2-0 lead, but Spurs battled back to reduce the arrears. Just after half time the hosts got a third, only for Spurs to restore the one goal deficit with a well taken diving header. Undeterred though, Brixham continued to push forward, when the temptation may have been to drop deeper and protect what they had. It was through this positive approach that a fourth goal finally arrived, it was to be the last goal of the game, and it was a much deserved three points for a Brixham outfit that inflicted only the third defeat on Spurs this season. It had been a very enjoyable day out in the town of Brixham and at Brixham AFC, but most importantly, Mrs Hatt had equally enjoyed the experience. Now then, I’ve got a 4G lined up in a cage in Bradford on the 11th November, what are the chances of…..in fact, no, quit while you’re ahead Bob, remember Anglesey?